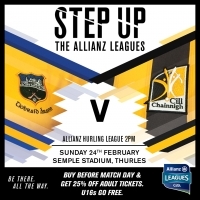 Kilkenny are back on the road next Sunday with a trip to Thurles to take on Tipperary at 2pm. Both teams failed to collect any points in their outings last weekend and will be hoping to get their league campaigns back on track. 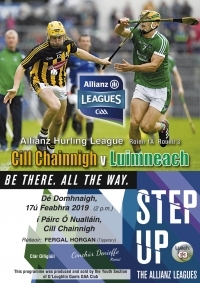 As the Allianz league enters its final rounds the battle for much needed points heats up and the outcome of this encounter will be vital for whoever can claim the two points this game has to offer. Tickets are available in usual outlets (Centra and Supervalu), pre-purchasing tickets will ensure a saving of €5 and faster entry to the ground on the day. Next Sunday will also see St Kieran's College contest the Top Oil Leinster Senior Colleges Final in Portlaoise at 12pm, the opposition will be Colaiste Eoin from Dublin. Colaiste Eoin overcame Kilkeny CBS by one point to claim their spot in the final, while St Kieran's overcame Dublin North. Both teams will be out for the win, which will secure a semi-final spot for the victor while the losser will have to contest an All-Ireland quarter final. On Saturday Castlecomer CS will contest the Leinster Colleges ‘B’ Final against Colaiste Choilm, Tullamore in Carlow IT at noon. The 2018 All-Ireland champions claimed all two points following their assignment in Nowlan Park on Sunday. The opening twenty minutes were a close affair but a period of Limerick dominance just before half time in which they claimed 2-3 proved crucial to the outcome. The teams headed to the dressing room at half-time with the score standing at 2-10 to 0-7 in Limericks favour. The second half proved to be a tough test for the home side with the visitors failing to give much away. Both teams recorded eight points in the second half, the game ending on a scoreline of 2-18 to 0-15. Kilkenny now have two away games, first up is Tipperary next weekend in Thurles on Sunday at 2pm, followed by Wexford away the following Sunday. The Kilkenny team that will line-out Vs Limerick on Sunday in Nowlan Park at 2pm has been named. A large crowd is expected in Nowlan Park for the game, a clash between the current league and All-Ireland champions. Tickets are on sale in selected Centra and Supervalu stores up until Saturday night, cost €15. Pre-purchase your tickets to save €5 and to speed up entry to the ground on the day. Clare claimed all two points in Ennis today after a nail biting finish which left the bare minimum between the teams at full-time, the scoreboard reading 2-20 to 1-22. A Kevin Kelly free on the the full time whistle bagged Kilkenny's first and only goal of the game. Kilkenny now have a weekend off, the next league outing will be against the All-Ireland Champions Limerick in Nowlan Park on Sunday February 17th at 2pm. The Kilkenny team to play Clare in the Allianz league this Sunday February 3rd in Ennis has been announced. The game has a throw-in time of 2pm.